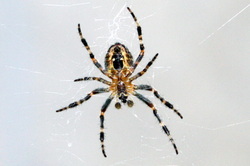 Barn Spiders are usually yellow and brown with striped legs. These spiders like to build their webs in wooden structures (barns!). Barn Spiders will spin their webs at night to hunt, then take their webs down during the day and hide in crevices. These spiders will typically stay outside, although they like to build their webs near porches and windows. Click here to learn about Black and Yellow Garden Spiders!